This is a delicious and nourishing soup to have when the weather is dry and cold. 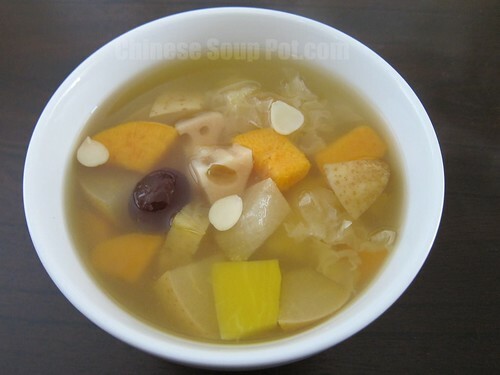 I like to drink this soup in the autumn and late winter seasons as a tonic for the body. It is very easy to make, and needs no additional salt, sugar, or other seasonings. Hence, this delicious soup is very pure, light, and low in calories. It is also very high in fiber as all ingredients in this recipe are plant-based. The main star of this soup is the snow fungus. Although flavorless by itself, other key ingredients like papaya, sweet potato, and pear all work wonderfully together to give this soup a very palatable light natural sweet taste. Snow fungus has been used by the Chinese as both food and medicinal purposes for more than 2,000 years for various ailments. Specifically, snow fungus nourishes the Qi and removes dryness and heat from the body. It nourishes the lungs, and it is recommended for those who have a dry cough, dry skin, chapped lips, dry nose and throat. Snow fungus is also know to help improve skin complexion. Impress your family and give this soup recipe a try! Click to read more on the health benefits of snow fungus. Rinse all ingredients. Soak snow fungus in water for a few hours or until soft. Cut into small florets. Soak red dates in water for 15 minutes. 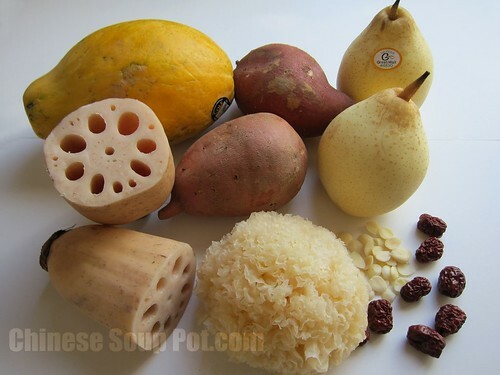 In the meanwhile, peel, seed, and cut sweet potatoes, lotus root, and papaya into small pieces (about 1″ x 1″). Cut the Ya Li pears into small pieces with the skin on for additional fiber. Put water in a pot and bring to a boil. Add all ingredients in and let the water boil up again. Cover and cook over low heat for 30 minutes. Serve. 1. The snow fungus can be soaked overnight to save preparation time. See the snow fungus ingredient page in the Common Ingredients section for more preparation details, health benefits, and buying tips.